The above picture of a tile setting in a sidewalk in front of an artisan store in Cuenca prompts this blog posting. The display shows the altitude as 2540 meters (8333 feet) at latitude of 2° 54’ 03” (south of the equator by 200.2 miles) and longitude of 79° 00’ 28” West. It may be surprising that Miami, Florida is farther west than Cuenca. Miami is at longitude 80° 13′ 27″ West. 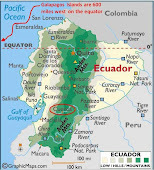 The four rivers that flow easterly through Cuenca have their water empty into the Amazon basin. This is also somewhat surprising since Cuenca is so close to the Pacific Ocean. However, a short drive (30 km or 18 miles) to the west of Cuenca into the higher Andes Mountains brings one to the Parque Nacional Cajas (Cajas National Park). Within this park is the continental divide. The highest point in the park is the 4,450 meter (14,600 feet) high Cerro Arquitectos (Architect's Hill). Julie and I have traveled the road in a commercial van that was taking us from Guayaquil to Cuenca. The trip was fascinating. The road crosses the continental divide at the pass "Tres Cruces" (which is at an altitude of 4,167 meters or 13,670 feet). Good pictures were difficult to take when one is in the clouds and the van is moving, but see pics below. Awesome. Did you see any alpaca?